You intentionally or accidentally deleted your files from your Hard Disk. It would be good, if those files were available in Recycle Bin and you can go for quick restoration. Sometimes we permanently delete the files from disk by pressing SHIFT+DEL or by emptying the Recycle Bin. Badly, you need those files after some time. So what to do? Don't worry, still we have a chance to get them back. What is happening in the Deletion process? When you delete any file or movie from hard disk, your operating system will just mark that space as available for further writing. 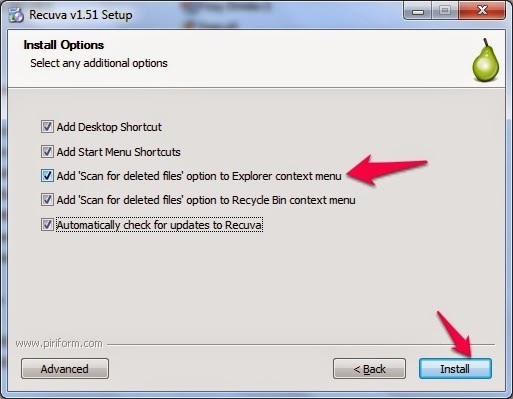 So when you want to save a new file or a new movie, the Operaing System may save that new file in the previously marked space or in a new space. You're lucky if it is in free space, your chances of getting that data are poor when it overwrites in the marked space with your new file. Don't panic, take a long breath and try this procedure without worrying. Step 1: Download a free software called Recuva and Start installation process. Step 2: During the installation process, you will find a screen with install options. Make sure to keep tick mark on the third checkbox. And click on Install button as shown in below figure. Step 3: Your installation process will finish in a moment and you will get a new welcome screen. Just click on Next button. 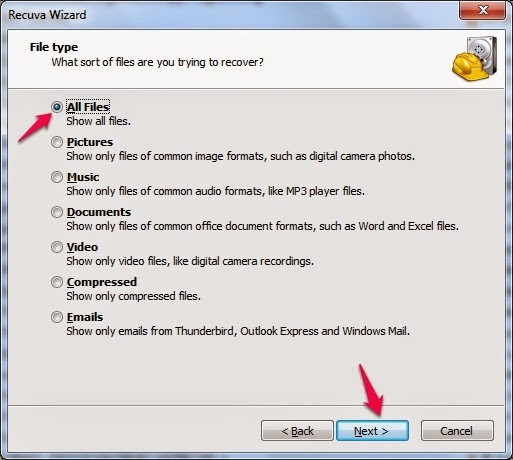 Step 4: The next window comes with a list of possible file recovery options. Make sure "All Files" radio button is active. Step 5: Select the file location, where you deleted your files. If you don't know, keep the default option as usual, such as "I'm not sure" and proceed with "Next" button. Step 6: Click on "Start" in next screen to start the scanning process. That's it. You're done! All your files were back. 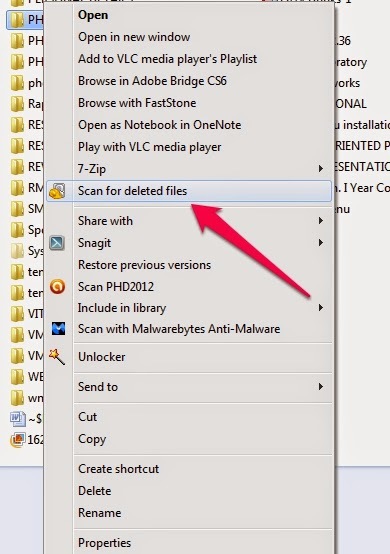 Note: You can Right click and select "Scan for Deleted Files" option on any folder or drive.